Polyethylene (PE) pipe and a full range of fittings are manufactured and supplied for sewerage and drainage markets. 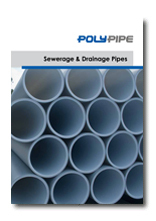 Poly Pipe Pty Ltd (Poly Pipe) supplies a range of pipe sizes and lengths for pressurised drainage and sewerage requirements. PE pipe is made in continuous lengths that allow customers to order custom lengths. AS/NZS 4401 - Drainage - S16-SDR33 and S12.5-SDR26. PE pipe is made in continuous lengths that allow customers to order custom lengths that reduce the cost to transport and install. With improved performance and exceptional durability, PE pipe has a life between 50-100 years. PE pipe does not corrode and is abrasion and chemical resistant.